- High quality nonwoven fabric,better than plastic container,protect environment. - Decreased risk of transplant shock with bag handles. - Keeps plant warmer in winter and cooler in the summer,Allow the root breathe, Prevents roots circling and air-prunes plant's root structure. 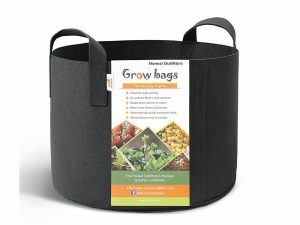 - Package: 5-pack 7 gallon grow bags. - Promise: The quality and service is our first aim.we can refund if you do not like our product.